Bill Turnbull joins in the Christmas preparations at St Davids in Pembrokeshire. The city's cathedral is the setting for festive music from tenor Rhys Meirion. Browse content similar to A Welsh Christmas. Check below for episodes and series from the same categories and more! to see how people here are celebrating Christmas. But first, I've got to vote for my favourite tree! So, I try to master a Christmas anthem in Welsh. There's always room at the inn here in St Davids. Carols from the city's stunning Cathedral. And festive music from Rhys Meirion. Come over here, come round here. There we are. Every child in St Davids gets a special gift from Santa. during the annual Christmas Tree Festival in the City Hall. It started back in 2004.
and as you can see, it's just grown. We do it every year now. It's a tradition in St Davids. at the Christmas lights ceremony in the city square. Peter's fruit and veg shop! and it's wonderful that people gather together. and yet everybody knows everybody and Christmas is an amazing time. but it's actually the UK's smallest city, on account of its hidden gem. and congregations have come together to sing for us. often sung at Christmas time, Ar Hyd Y Nos, All Through The Night. One of them involves this young fellow here. he becomes part of the city's Christmas preparations. The first Sunday night is when the bambino's first presented. throughout everyone's homes to be part of their Christmas celebrations. they'd like a nice companionship of having Christ come into their lives. It's the sign Christmas has finally arrived when Bambino arrives. that's why he have the bambino. to be part of the celebrations in time for Christmas Day. Why do you like him coming into the house? Because he's so special and soft. -that's why he needs his special blanket, doesn't he? -Did you have a blanket when you were born? it's wonderful for them to be inspired by that. Christmas is all about celebrating Jesus's birthday. And so having baby Jesus reminds us of that, doesn't it? -Father Christmas as well, yes. and that's what's so important in our lives, when he comes to us. # Must I walk this path alone? # Should have had my place? -You take them out for me. OK? even Father Christmas needs some extra help. We all become Father Christmas and we do a toy appeal. who can't afford the added expense that Christmas can bring. when everybody is giving and receiving. It's Jesus's birthday, it's good to give presents at Christmas time. that genuinely say, "Christmas was cancelled until PATCH came along. "We told our children, 'No presents this year.'" and their faces just light up. and that all gets put in a box and delivered to the parents. so it's really from the mums and dads and not this anonymous charity. I came and helped last Christmas. It's just a year coming up now. I heard about PATCH and it's a good project. the community around me, and so I really thought, "Why not? "give a couple of days of my time and just really help out?" so for me it's just part and parcel of what I'd normally do. that give to us. I'm overwhelmed so many times by people's generosity. and it's the most fantastic job in the whole, wide world. and funnily enough for the Land of Song, it involves some singing. Well, this is a baptism of fire, isn't it? who've just performed it perfectly. -Doesn't seem very fair. Can I do it? -What are we going to do? I need help with the words. as this special service called Plygain has been held here for more than a century. -You haven't heard me singing yet! on Christmas morning, and the word "plygain" means "before cockerel". There's a word which is just hopelessly long. I'm never going to manage that. anytime between three and six o'clock in the morning. But the latter is the more commonly favoured time for us in St Davids. and the birth of a new day. -From the beginning, this is. -I don't want to do this! but his writing on the blackboard is still preserved. It tells of the birth of Jesus Christ and how we was the star. Hosana heddiw sydd, swn nefolaidd fydd. and we're praising Jesus on his birthday. Much better when I conduct. I think I'm going to have to take some home. 'to overindulge on lovely food. 'Indeed, where would we be without our Christmas turkey? All home products, all Welsh products. And I thought it was such a lovely bird, pity to kill it, and I said so. At that stage, I was only 19 years old. So, he didn't say anything. Next day, he returned with two turkey hens. there are many more turkeys at the Davies family farm. We're producing 10,000 this year, so we've started production. -That's a lot of Christmas dinners. It's an awful lot. It's a big responsibility as well, you know? turkey plays a huge part of the Christmas Day meal, doesn't it? So it's an exciting time. We're all very excited. let alone in a farm business. Let alone three generations of women in a farm business. Yes, it's girl power, I tell you! So here's to the girls who rule the roost on the turkey farm! Absolutely! There's no messing with us Davies girls, I tell you. and a lot of pressure, I would imagine? It is pretty manic. Christmas for us starts back in July, August time. We have the day-old chicks, they arrive here at the farm. It all starts back in July, August. We've started properly now for Christmas production. That's where your faith comes into it, you know. these very, very sort of challenging few weeks ahead of us. and it's an awful lot of praying, hoping that everything will go fine. and we always promise that we deliver that. I think faith definitely carries us through that. and the commemoration of your birth. in giving rather than in receiving. with Kevin Whately and Tina Hobley. 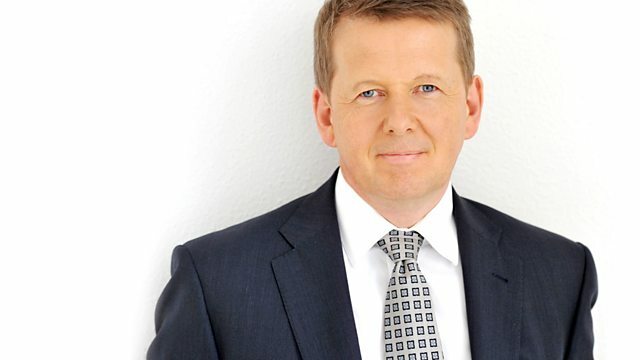 Bill Turnbull joins in the Christmas preparations at St Davids in Pembrokeshire, where every child is guaranteed a Christmas present and there's always room at the inn for one special baby. The city's historic cathedral is the setting for traditional carols and festive music from Welsh tenor Rhys Meirion.